LAHAINA CANNERY MALL. Thursday (today): Hula lessons, 5 p.m.; Halau Hula O Keola Ali’iokekai, 6:30 p.m. Saturday: Family Magic, noon; Halau Hula O Keola Ali’iokekai, 1 p.m.; Yu-Gi-Oh card session, 3 p.m. Sunday: Na Kamali’i Nani O Lahaina, 1 p.m. Tuesday: Free ukulele lessons, 5:45 p.m.; Halau Hula O Keola Ali’iokekai, 6:30 p.m.
MAUI MALL. Saturday: Grandparent Day at Regal Maui Mall Megaplex, free screening of “Leap!” at 9:30 a.m. for first 100 grandparents and grandchildren with RSVP by calling 269-7396 or emailing grandcaresmaui@gmail.com. Sunday: Zumba by Keoni’s Hot Lava DanceFit Studio, 9 a.m.; Whole Foods Arts & Craft Fair, 10 a.m. to 2 p.m.; Hula by Hui! Lanakila, 11 a.m. OUTLETS OF MAUI. Thursday (today), Saturday, Monday and Wednesday: Tahitian show, 6 to 7 p.m. Friday: Aloha Festival Market, 4 to 8 p.m.; Hula lessons, 2 to 3 p.m.; Hula Show, 5 to 5:45 p.m.; Jack Stone, 5 to 7 p.m. Saturday: Jack Stone, 5 to 7 p.m. Sunday: International Dance, 6 to 7 p.m. Monday: Coconut Husking demo, 4 to 5 p.m.; Vicente Cacal, 3 to 5 p.m. Tuesday: Ukulele lessons, 11 a.m. Wednesday: Lei making, 2:30 to 3:30 p.m.; Hawaiian arts and crafts, 4 to 5 p.m.; Mike Finkiewicz, 5 to 7 p.m.
QUEEN KA’AHUMANU CENTER. 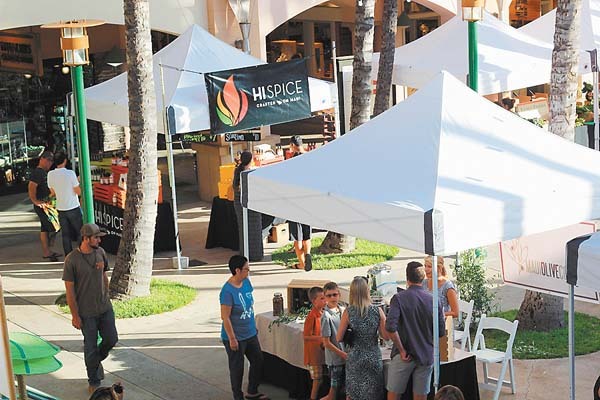 Friday, Tuesday and Wednesday: Farmers market, 8 a.m. to 4 p.m. Thursday (today): Tai Chi by Southern Praying Mantis, 10 to 11 a.m. Friday: Blue Zones Project Celebrity Chef Cooking Demo by local celebrity chef Maja Liotta, 6 to 7 p.m. Saturday: Maui Family Support Services’ Stand for Children Celebration and Support Rally, with live entertainment, fun activities and early childhood education, 10 a.m. to 2 p.m.; Maui Autoholics Cruise Night, 5:30 to 9 p.m. Sunday: QKC and 98.3 DaJam welcome keiki 12 and younger to Keiki Koloring Korner, 10 a.m. to 2 p.m.; Ku Mai Ka Hula – Hana Hou, adult hula competition, 11 a.m. to 1 p.m. THE SHOPS AT WAILEA. Thursday (today): Coconut frond weaving, 2:30 to 3:30 p.m.; Polynesian show, 5:30 to 6:30 p.m. Friday: Ukulele lessons, 3 to 4 p.m.; Pau Hana with Kason Gomes and Chase Fevella, 4 to 6 p.m. Monday: Lei po’o making, 2:30 to 3:30 p.m.; Ukulele lessons, 5:30 to 6:30 p.m. Tuesday: Coconut husking, 2:30 to 3:30 p.m.; Polynesian show, 5:30 to 6:30 p.m. Wednesday: Island wood carving, 10:30 a.m. to 1 p.m.; Lei po’o making, 1:30 to 2:30 p.m.; Market at The Shops on the ground floor, 4 to 6 p.m. THE WHARF CINEMA CENTER. ­Friday: Uncle Lui Williams, 5 to 7 p.m. Monday to Sunday: On-site artisans and crafters. Daily: Plantation Days Museum, 9 a.m. to 6 p.m., upper level; admission is free. WHALERS VILLAGE. Thursday (today): Hula lessons, 3 to 4 p.m. Friday and Tuesday: Lei-making class, 11 a.m. to 1 p.m. Saturday and Wednesday: Hula show, 7 p.m. Sunday: Live music, 6 p.m. Monday: Ukulele lessons, 2 to 3 p.m.; 3 to 4 p.m. (six students per class). Tuesday: Free movie “Captain Underpants” screening on lower level courtyard.